Finally, a game that truly advertises what it is -- a scam that'll clearly rob you of your beloved money. Don't buy it. I'm not ashamed to admit it -- I like the Ed, Edd n' Eddy show that airs on Cartoon Network. Yeah, I'm in my 30's but that doesn't mean I can't have something to turn to when I'm not vaporizing everything in sight through my luxurious video game journalism career. Watching the three Ed's attempt to scam the neighborhood kids out of money is a hoot, particularly because Eddy (the stupid one) just has so many comments that are out of whack. Out of nowhere he'll just say "Buttered toast!" and it's just right. 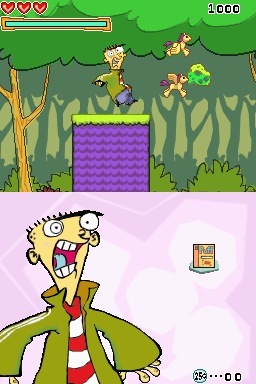 Unfortunately, that moment never arrives in the Eds' latest game for the Nintendo DS, Scam of the Century. In fact, fun never arrives at all. In the game, the Eds find themselves up crap creek without a paddle when someone steals their Book of Scams. The neighborhood kids get a hold of it and act accordingly, hunting them down with a vengeance. Yeah, never mind that parents should be doing the punishing here. There's also a "superhero" going after them, with a melon on his head and a sidekick that's a piece of plywood named Plank. (What, not Super Plank?) Throughout the game, you'll have to endure numerous platforming levels with the three Eds. That is, if you really, really want to. And you won't want to. The gameplay is tepid early 90's stuff, reminding me of the crappy old Ren and Stimpy platformers that came out for the SNES. This is uninspired in every aspect, particularly when you have to use the Eds' super-talents by...get this now...tapping somewhere on the touch screen. You have to take your hands off of the controls momentarily just to find that "magic spot" that makes Ed spin a loogie or Eddy sneeze. 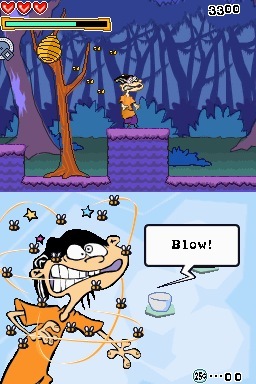 The power-ups, including Eddy's "stinky cheese", fail to help at all. Worse yet, with the kids constantly in pursuit, your turn's up in a flash. They can't be stopped, which doesn't make any sense. Why can't the Eds come up with a new scam? Were they fresh out? The presentation's mild at best. There are animated characters featured on the bottom screen that look just like their Cartoon Network counterparts. However, the in-game action itself is horribly displayed, with very little detail or inspiration taken from the show. There's hardly a peep out of the audio either. There's a few lame jazz tunes and popping sound effects, but not a sound sample in earshot. Not from the kids, not from the Eds, only pure silence so you can hear yourself sigh over your ill-fated purchase. You would think that mini-games would liven things up at least, but they don't. One actually has you pop zits on Eddy's back. Excuse me, is this SUPPOSED to be fun? If I wanted to go and pop zits in a competitive manner, I'd enter an Oxyclean "Pop 'Em If You Got 'Em" tournament and go to town. Seriously. Another actually has you selecting between various meats. Yes, meats. There's no racing action, no entertaining arcade throwbacks. Just a collection of worthless, meaningless garbage. Which sums up the game in its entirety. Don't buy into this Scam. Century doesn't offer any redeeming values -- not to its fans, not to kids, not to newcomers, not to anybody. If you buy into this, then someone a mad exec will be laughing as he's mad $30 off of you. Do yourself a favor and watch the show instead. At least there you'll get your fix of buttered toast. What's Hot: The bottom screen features animation cels taken straight from the show. What's Not: Terrible and frustrating platforming gameplay; lame mini-games; no sound bites whatsoever; no real reason to play.